Born in Weehawken, New Jersey in 1948, Arthur MacCaig directed and produced documentary films starting in 1978. He produced numerous reports for the television service of the Organization for Economic Cooperation and Development in Paris, and was the founder of DATHANNA, independent production company of documentary films. MacCaig received a degree in anthropology from the University of Hawaii in 1971, and a degree from France's National School of Cinema in 1977. He passed away in Belfast in 2008. Icarus Films distributes ten films by MacCaig, including the 2005 release A SONG FOR IRELAND. States of Terror -Investigates the role played by the Spanish and French governments in a campaign of terrorist acts designed to suppress ETA and the Basque Separatist movement. Irish Voices - Examines an unusual loophole in Britain's attempt to quell media access in the Irishconflict. Irish Ways - Resuming where The Patriot Game ends, examines the current conflict in Northern Ireland, now over a quarter century old. Euskadi: a Stateless Nation - The first definitive film treatment of the Basque-Spanish conflict, a look at the tumultuous history of a long running struggle which is far from its resolution. 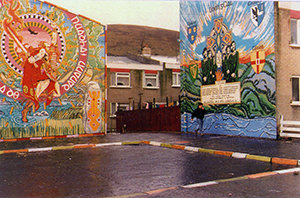 The Patriot Game -Rich in emotional images, often tender but more often terrifying, tells the story of the long and bitter battle for Northern Ireland.